First off we’d like to apologize for the amount of time since the last post! The academic year finished with the stress of exams, and when we got back from San Francisco our family and work commitments left little time to give this blog the attention it deserves. I hope this (extra long!) 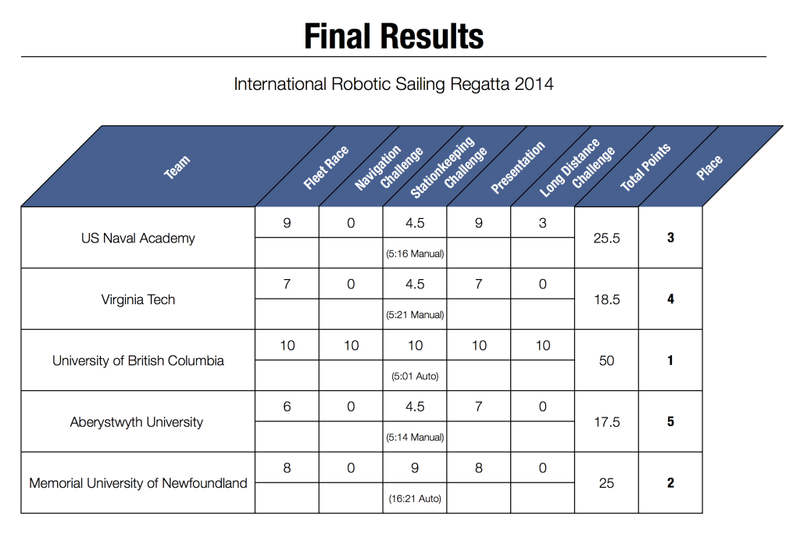 post covering everything that happened at Sailbot 2014 will make up for it! On the first day of the competition we entered the fleet race, a test designed to be completed under Radio Control to showcase the boats. We decided to use our larger, low wind sail configuration in order to try and get a speed boost. Unfortunately we learned the hard way that, when sailing, more power does not necessarily mean more speed! Our boat suffered from huge amounts of weather helm (this is when the wind causes the boat to turn into the wind, diminishing rudder control) and we found that we could not tack, making it very difficult to complete the first upwind leg of the race. After battling the wind and strengthening currents for quite some time, we decided that it would be best to bring the boat back in before something got damaged, make some changes such as tightening up the mainsheet, and try again the next day. On day two the conditions were looking pretty calm so we decided to have another go with our low wind sails. Having tightened up most of the lines on the rig and added battens to the sail itself to stiffen it up a little, we hopped onto a chase boat being driven by the Memorial team to make another attempt at the fleet race. The boat went into the water and shortly afterwards the wind decided to pick up. Despite our attempted fixes we experienced similar issues to the previous day, except this time, instead of bobbing towards the open channel, the boat was drifting perilously close to a very nasty, rocky patch of shore! This was made worse by the fact that Memorial’s boat was also having issues and they were struggling to bring it on board at the time. Thankfully for us they realised how much trouble we were about to be in, dropped their boat and powered towards Kitty. With some brilliant driving, a bit of muscle, and some very wet clothes we managed to get both boats on board and back to the workshops without any damage. We also entered the Station Keeping challenge, the aim of which is to keep the boat in a square area marked by buoys for as close to five minutes as possible. We did this under RC and achieved a good time of five minutes and fourteen seconds. The day finished with a presentation by Richard Jenkins, the CEO and founder of Saildrone LLC who talked about the story of, and technology behind, Saildrone and Greenbird, which currently holds the land speed record for wind powered vehicles. It was fantastic to have the opportunity to listen and talk to such an accomplished engineer and be able to take away some new ideas to improve our own boats. On day three all the teams headed over to Downtown San Francisco where we joined the 33rd International Conference on Ocean, Offshore and Arctic Engineering (OMAE 2014) to present our boats to judges, one of whom was Erik Berzins, who later made his own presentation about the development of the Emirates Team New Zealand boat for the Americas Cup. For our presentation we scored a respectable 7/10. The judges were particularly impressed with the software architecture we developed for Kitty. In the lunch break Louis had a really interesting conversation with Dave Peacock, lead software developer for Saildrone. 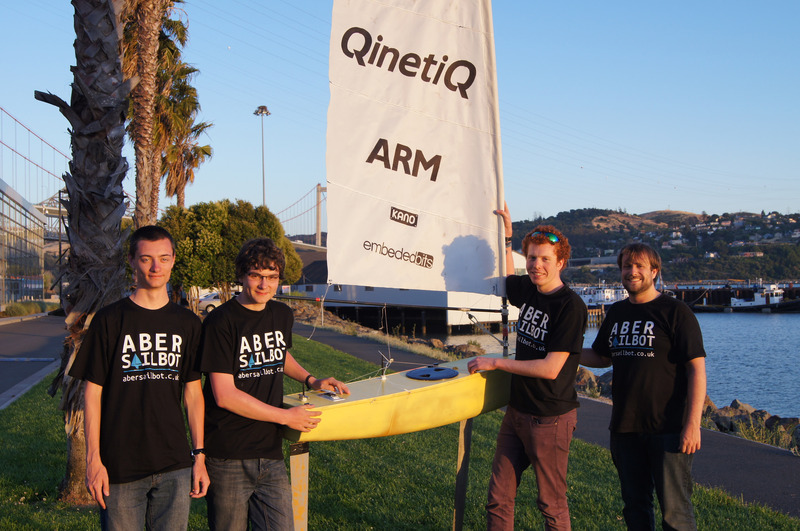 It turns out that we have managed to develop a very similar solution to the system they are using in their boat! I think it’s safe to say that Erik Berzin’s talk on the development of Team New Zealand’s AC72 yacht had us all lusting after the idea of building a boat with hydrofoils, although this may be a little ambitious! Perhaps it’s a dream to pass on to a later year’s team when our engineering skills have improved. Day four saw the last scheduled event, the long distance race. Last year we did very well placing 2nd on a 6km course. This year’s race was a bit more daunting as it involved 9.6km of currents, container ships, and the odd high-speed ferry. 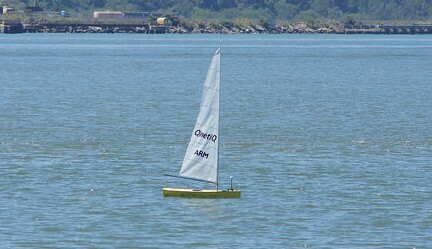 Nevertheless we were confident that we could complete it, so we set out onto the water with a chase boat to ourselves. Our attempt did not get off to a good start as our compass appeared to malfunction, giving very erratic, and very incorrect heading readings. Given that we were already a couple of hours into the six hour window we had to compete in, we decided that our best bet was to forgo autonomous control and use RC to complete the course. We made some reasonable progress until calamity struck and our sailwinch jammed. This is something that had happened to our previous boat, Dewi, at last year’s WRSC and the reasons for it were still a bit of a mystery to us (we have now solved this problem and will publish details soon). It meant that we could no longer sail, so we brought the boat back in. It was a little disappointing that this happened but in all honesty we were mostly glad that it had happened at this point in the competition rather than at the very beginning. On our very last day at Cal Maritime we were given a tour of their simulator facilities. These included two Bridge simulators and a steam power plant simulator. They are used to train crews on how to handle various situations, which would be too expensive or dangerous to practice in real life, on a variety of boats. The bridge simulators were incredibly convincing and most of us found ourselves swaying side to side to try and stay upright despite the fact that both were completely stationary. The steam plant simulator was particularly impressive as the majority of the machinery and equipment had been taken from a decommissioned ship, with heaters and (very) loud speakers added so that the whole environment was as close to the real thing as possible. We will update this when we get a hold of the full results, although it’s pretty representative of everyone’s final scores. While we may not have scored as well as we might have hoped, the whole experience has certainly been worthwhile. We discovered a lot about marine engineering and met some fantastic people. We are really looking forward to making use of the lessons we’ve learned and taking our new intake of team members, and an upgraded boat to next year’s competition in the city of St John’s, home of Memorial University Newfoundland. We’d like to thank all our sponsors, without whom this whole experience would not have been possible. This last week has been Easter break. With all this extra time free from lectures and assignments, we worked on the boat full time! Here’s a summary of the main work done. First off, the mast step was shaped and fitted into the hull. This is made from a block of foam shaped to fit the hull, which keeps everything lined up and acts as a base for the layers of glass fiber. Next, we made the mounting for the electronics box. It will neatly clip onto a set of rails inside of the boat. This means we can keep the box centered, and adjust its position. This will be helpful if there are balance issues later on. I miscalculated the extra height of the clips and found that the box would no longer fit inside the hatch and neatly slide onto the rails. This meant a bit of dremeling to cut a slot inside the deck to allow the box to pass through the hatch and onto the rails. The deck was worked on in parallel to the electronics box mounting. 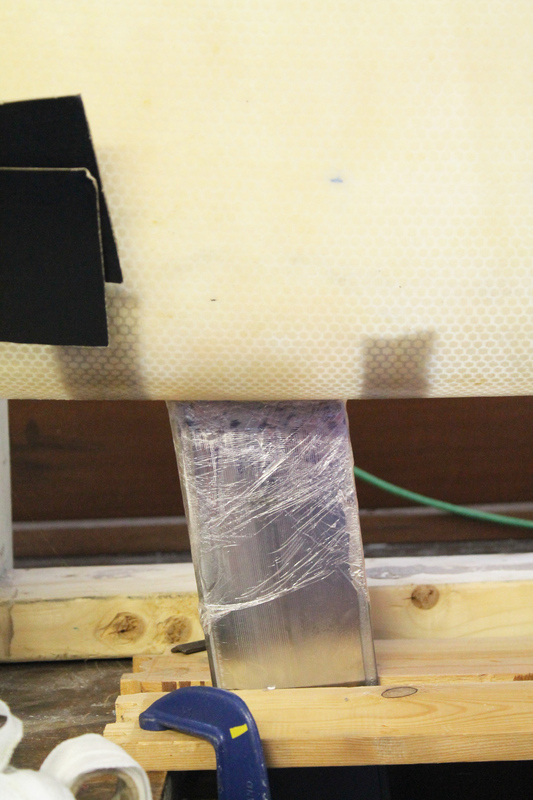 The deck is made from high density polystyrene, sandwiched between two thin layers of fiber glass. 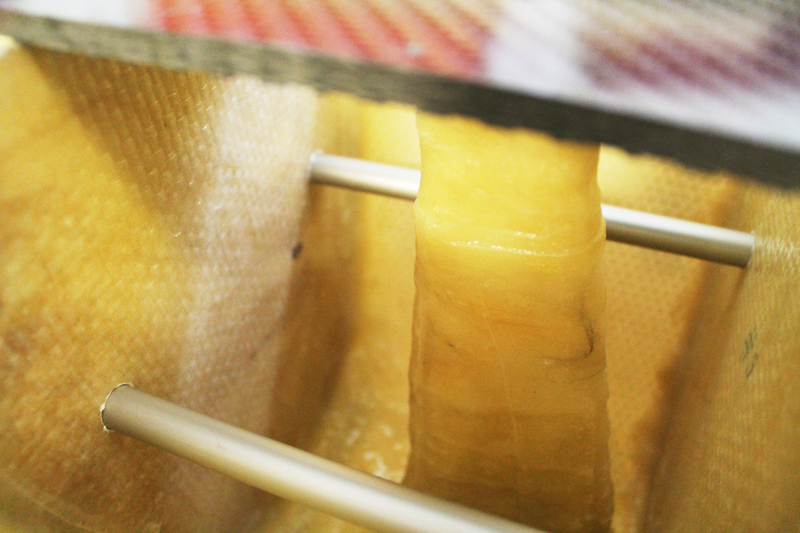 This is strong, lightweight, easy to produce and costs a lot less than buying something similar off the shelf. The foam comes in rectangles shorter than the boat’s length, so we laid out and lightly taped them together. We then measured the shape of the deck from CAD files onto the foam surface. After this, we glassed each side and cut holes for most of the through-deck components , such as hatches, mast mount and actuators. We will have to wait until Wednesday next week to carry on with hardware, since the University is shut for Easter weekend. On Saturday, March 8th, we traveled to Swansea to present the bot at the Swansea PiJam. The event went well and we got a lot of positive feedback from the attendees. We also had the largest project in the room by about 1.2 meters! We gave a presentation at the event. 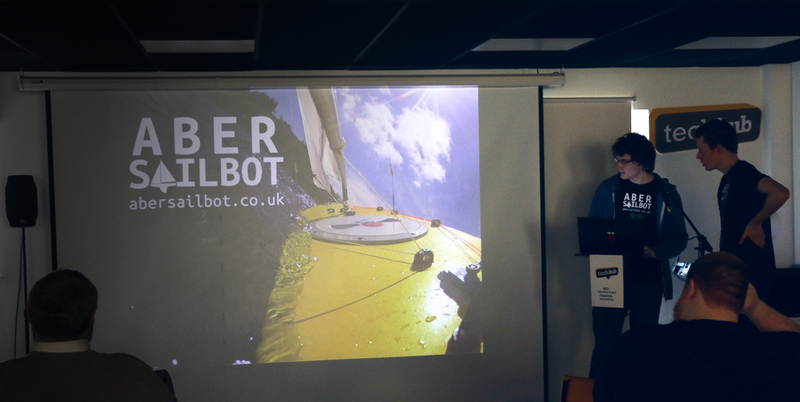 The event was hosted at the Swansea branch of Techhub, a coworking location for startups. There were some other really interesting projects, like a stereo vision application using a pi. Overall, it was a really nice experience and let us share what we’re working on with some cool people and see others’ interesting projects. 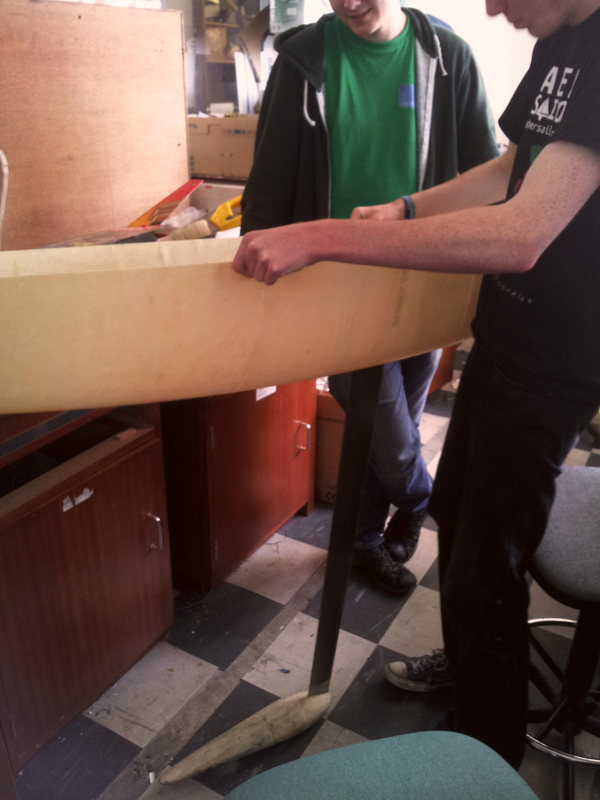 Back home, we continued working on the rudder and are in the process of making prototype sails. 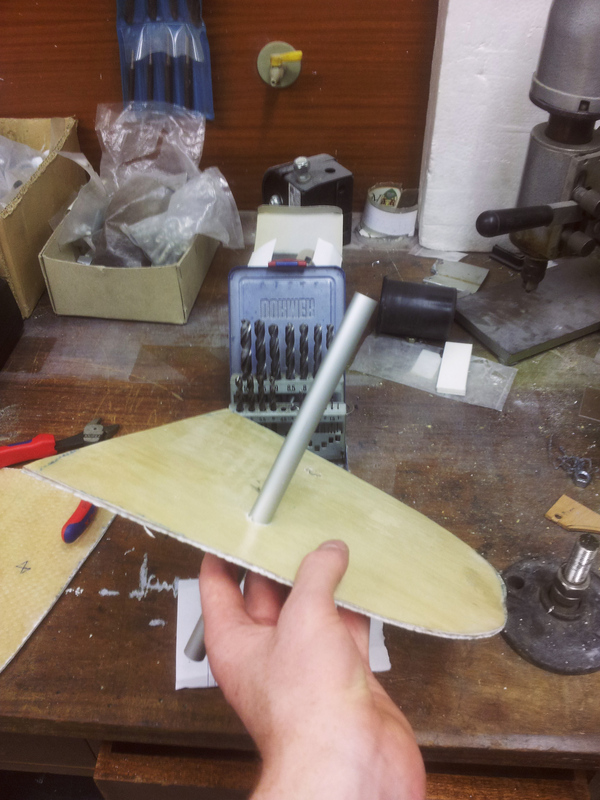 The rudder has been shaped, classed and primed and now needs another coat of filling primer and a finishing sand before getting its final coat of paint. The first iteration of our sail plan for heavy wind has been printed and cut out of roofing felt. 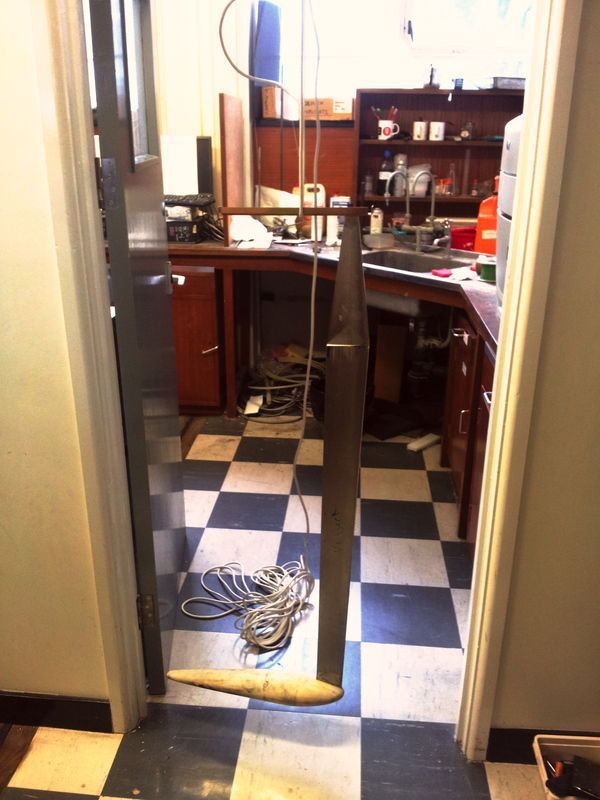 We hot glued the cut pieces together and fitted them onto our mast. 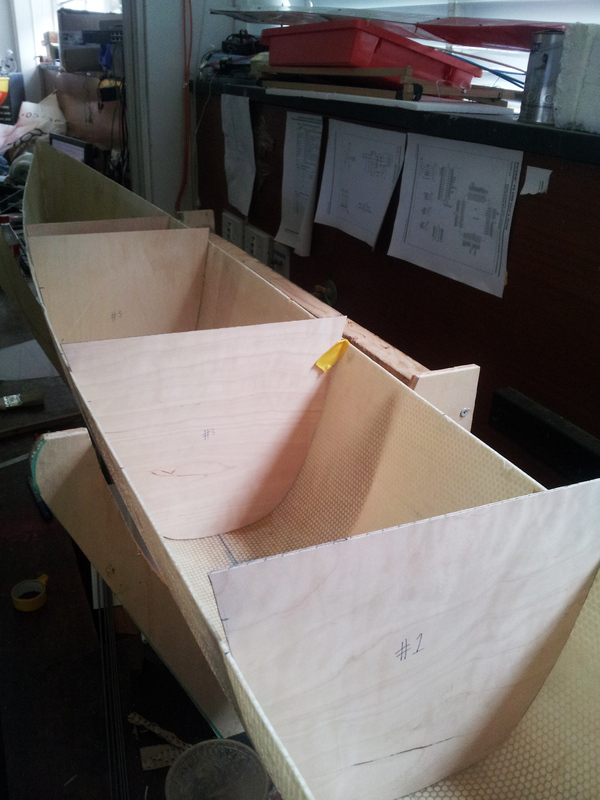 The electronics deck and bulkheads are in the hull along with a seat for the keel. 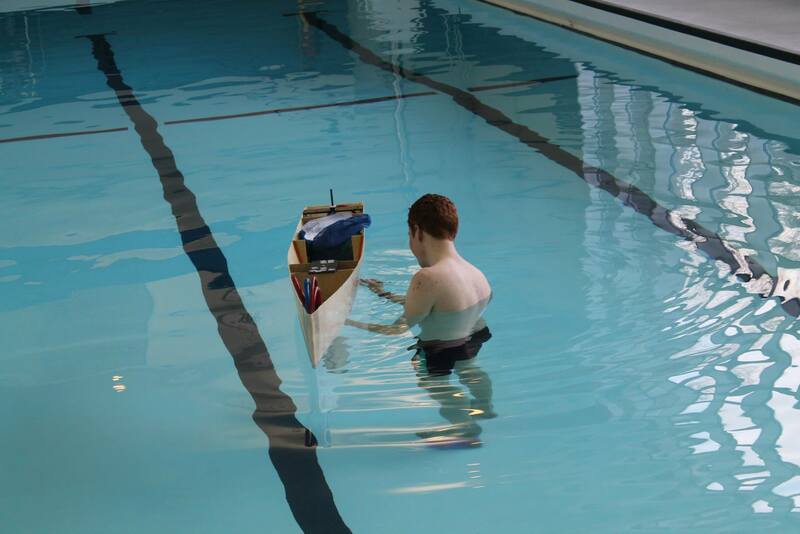 We had our first successful water test in the Aberystwyth Sports Center pool. 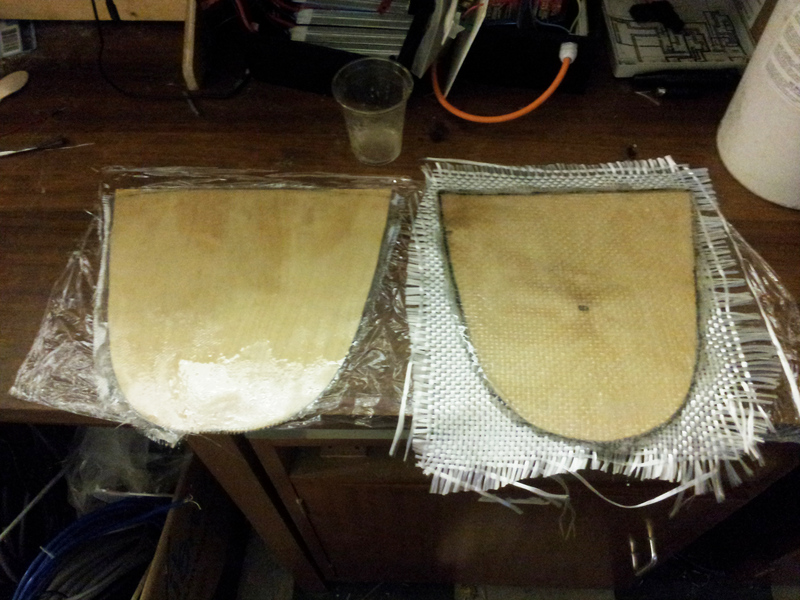 Over the past few months, we’ve also been testing electronics and writing software. We got a shiny new hull designed by the US Naval Academy! The keel! The centre of mass of the keel was determined by suspending it from a rope. The centres of mass of the hull and keel were lined up. 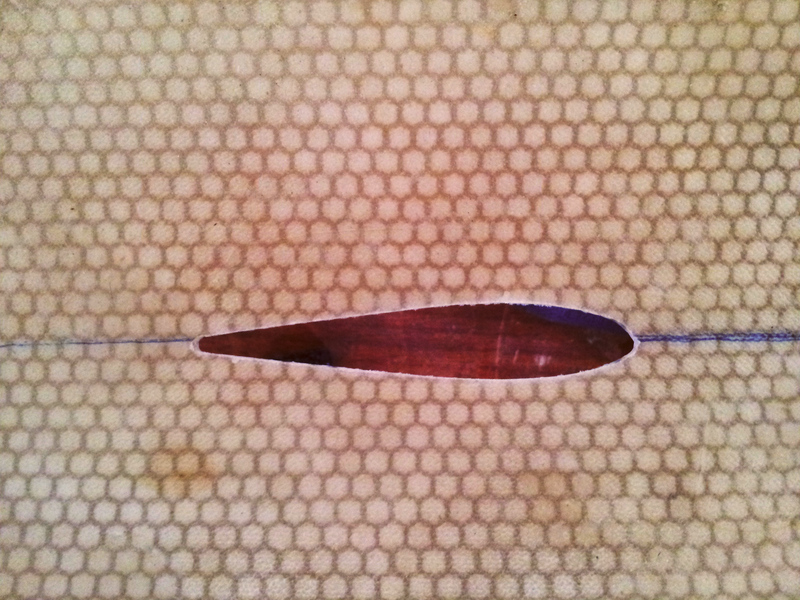 Then the hole through which the keel will fit into the hull was filed to the shape of the keel. Checking to ensure proper keel fit. 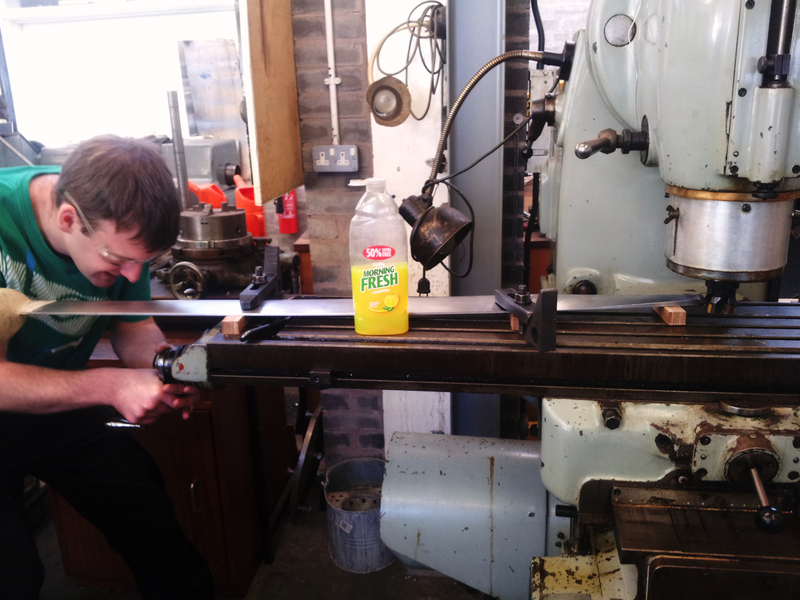 The keel was a little long for our hull, so we took 7mm off the top with a mill. 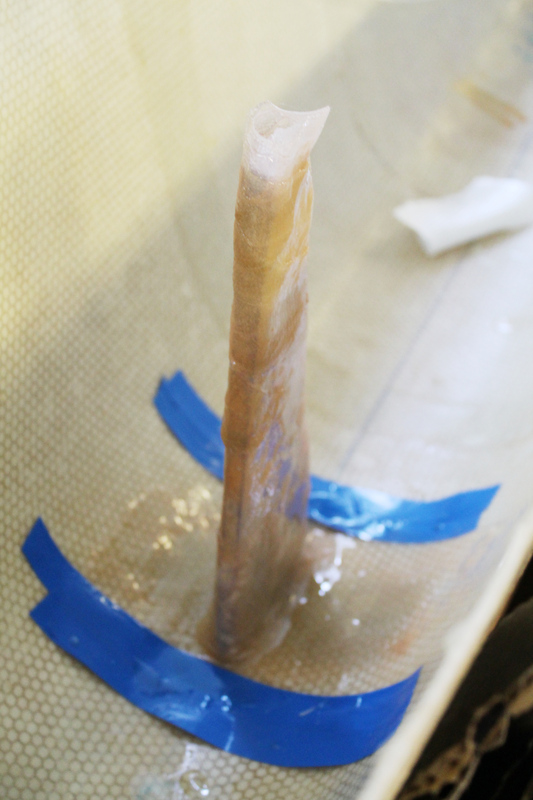 Next, we covered the keel in wax and wrapped it in cling film. We then pushed it through the filed hole in the hull and clamped it in place. The keel seated into the hull and ready for attachment, as seen from outside the hull. 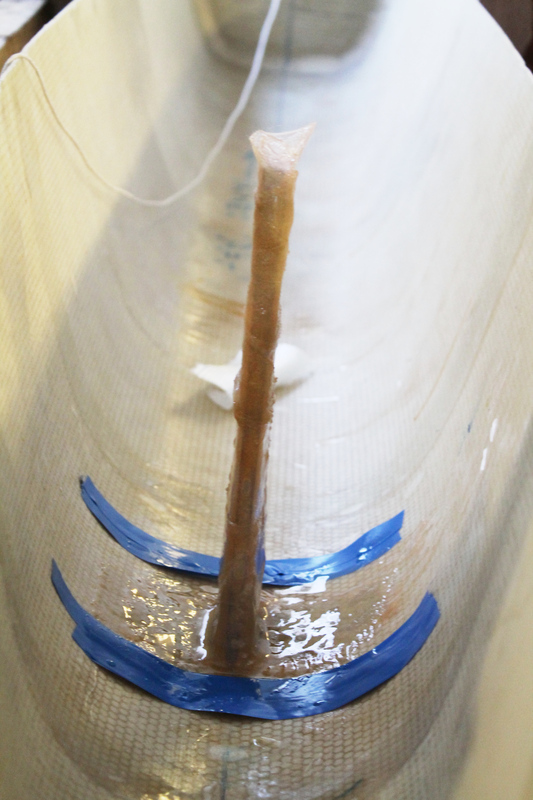 We wrapped layers of glass cloth tape around the keel and along the base of the hull and applied epoxy. 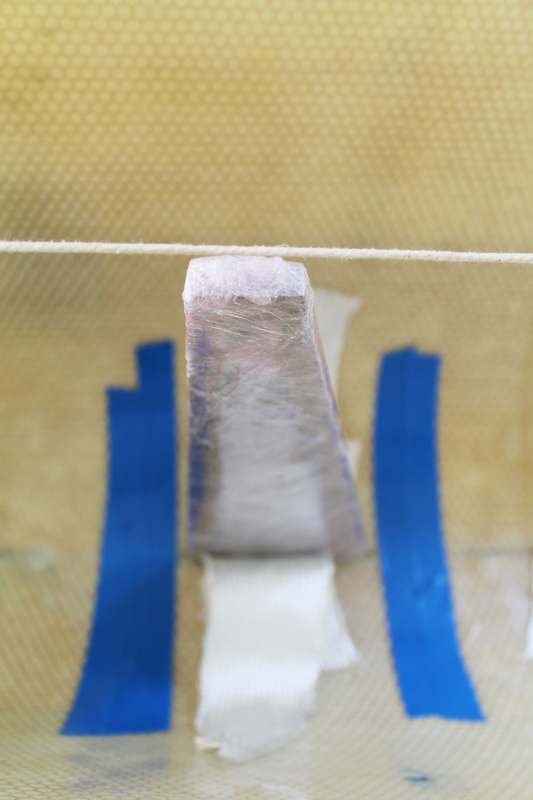 After a few layers had cured, the keel was slipped out from under the hull. 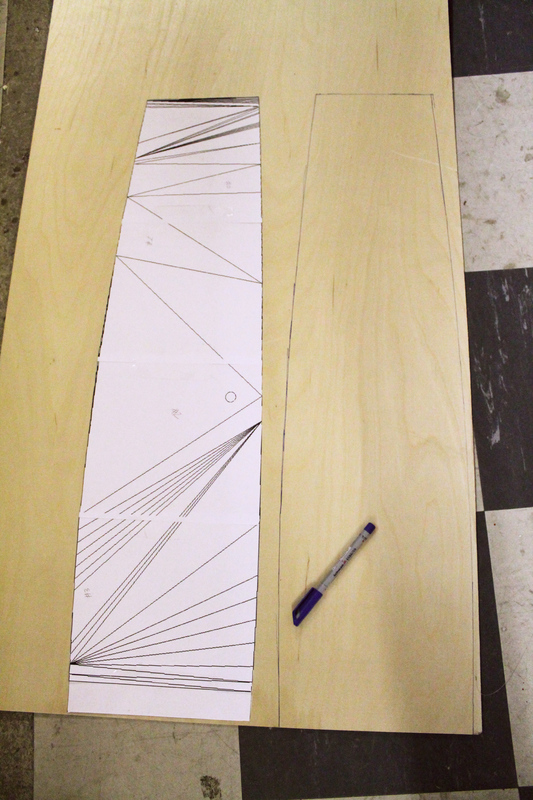 Templates for the ribs were created by cutting the hull CAD into slices and printing these cross sections. The rib templates were transferred to plywood and then cut to size. 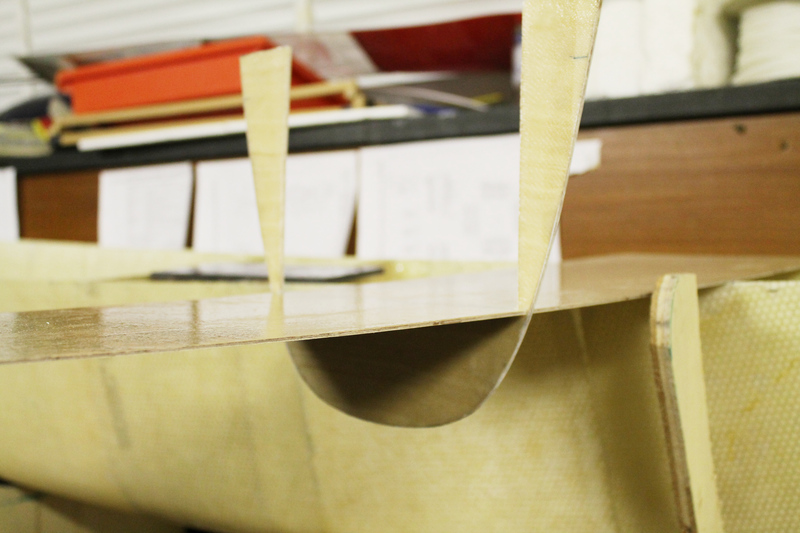 The ribs supporting the keel need to be strong, so we applied a layer of thick glass fibre to both sides of each. 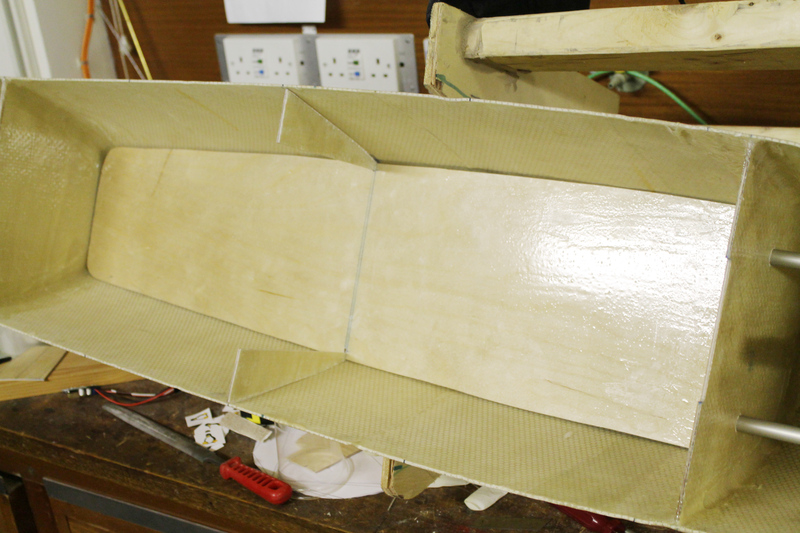 A plywood rib with the fibre glass applied. We drilled a hole through the ribs and inserted an aluminium tube. Wires will pass through this. An indentation was cut at the top of the two ribs closest to the keel. 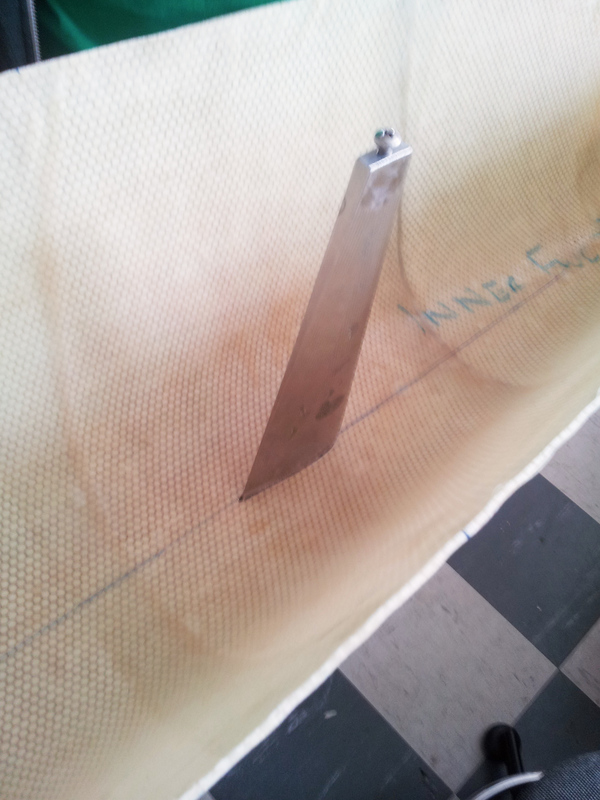 A carbon fibre sheet was placed into this indentation to spread the load of the keel. The hull was lightly pressed into the ribs as they were epoxied and glassed in place. 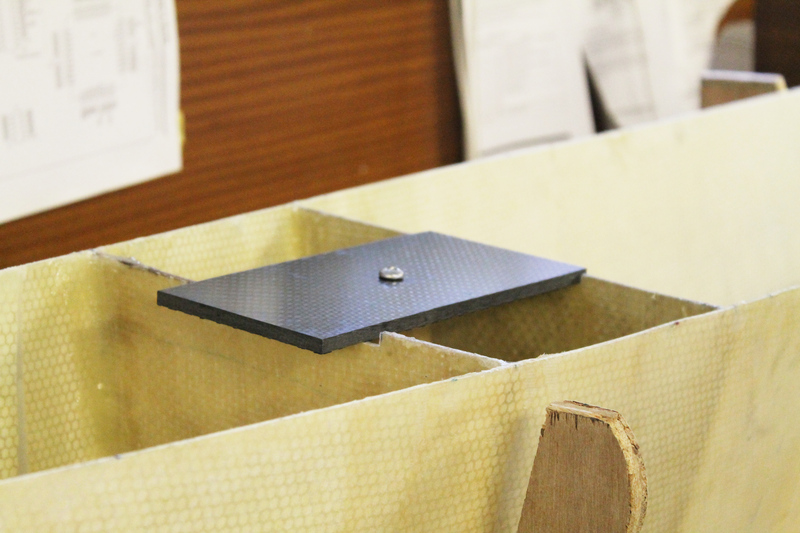 The keel is held in place by a bolt running though the carbon sheet. The load will be spread by washers. 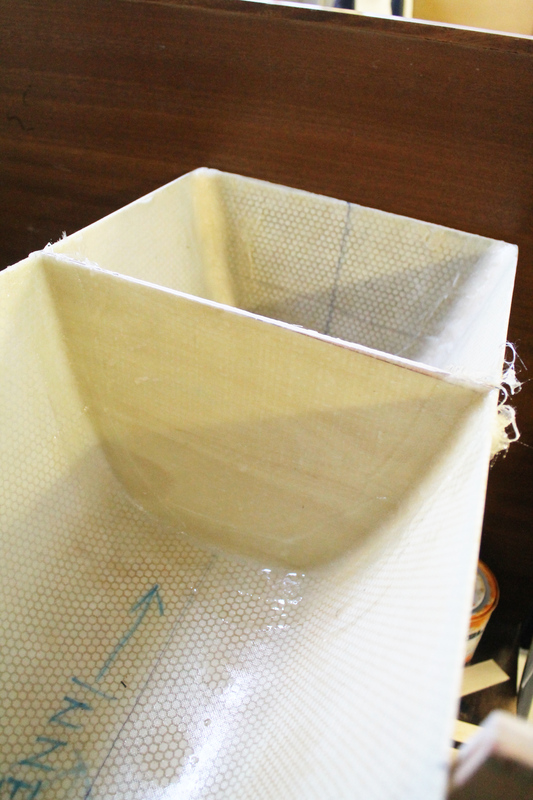 Water is prevented from entering the hull by the waterproof keel seat made from glass tape and epoxy. 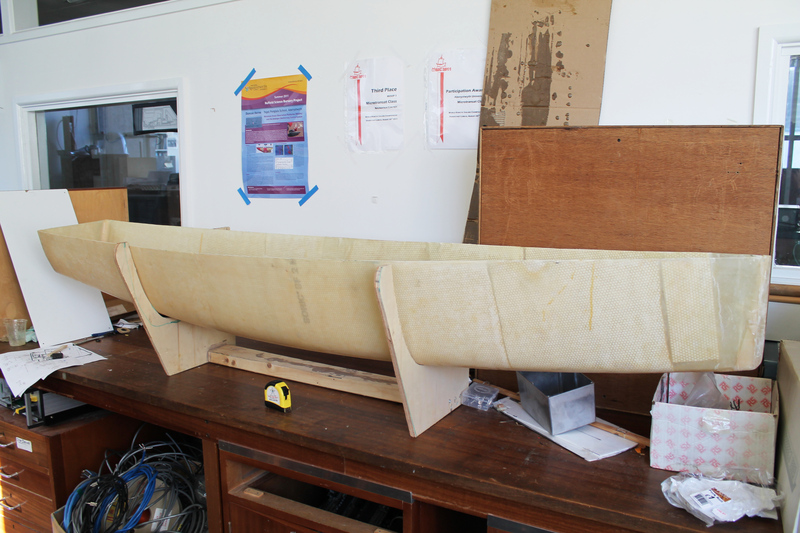 The keel seat will be fused to the carbon fibre sheet with epoxy. 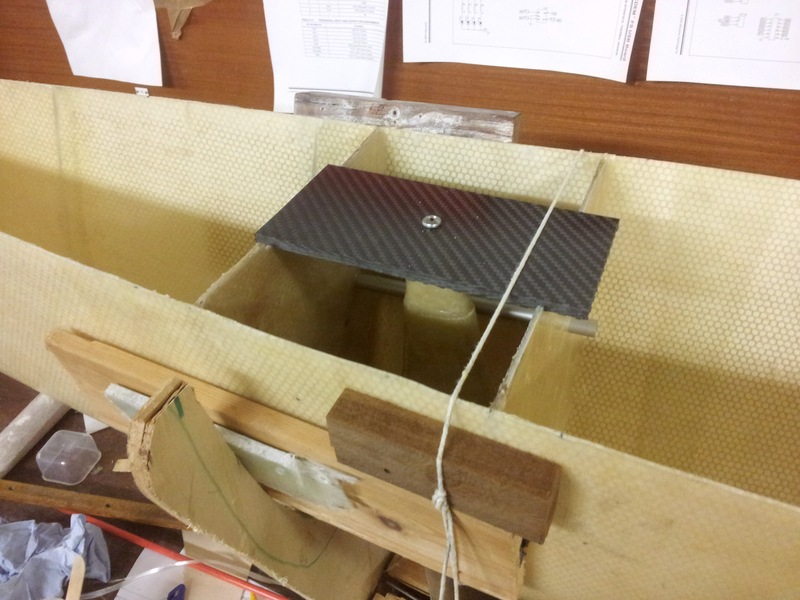 Another view of the keel seat and carbon fibre sheet between the bulkheads. The aluminum tubes are for wire routing through the hull. Rib placed at the stern of the boat. Now we need an inner deck for electronics. 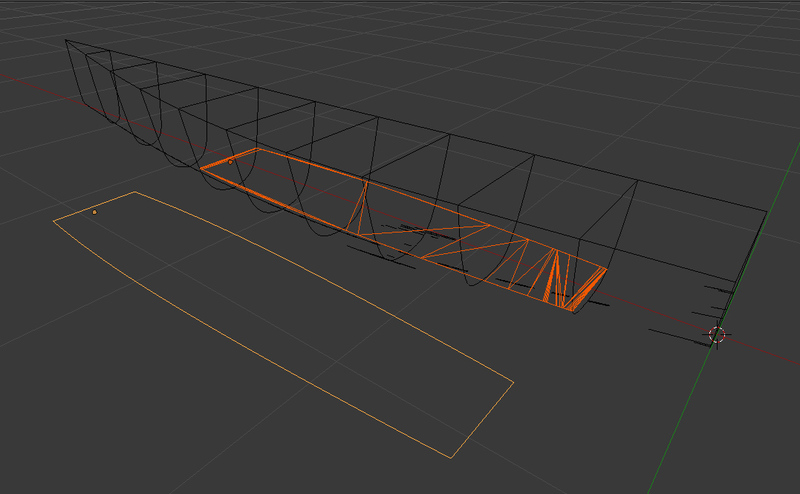 To create a template, we made a horizontal cross-section of the hull CAD at the desired height. 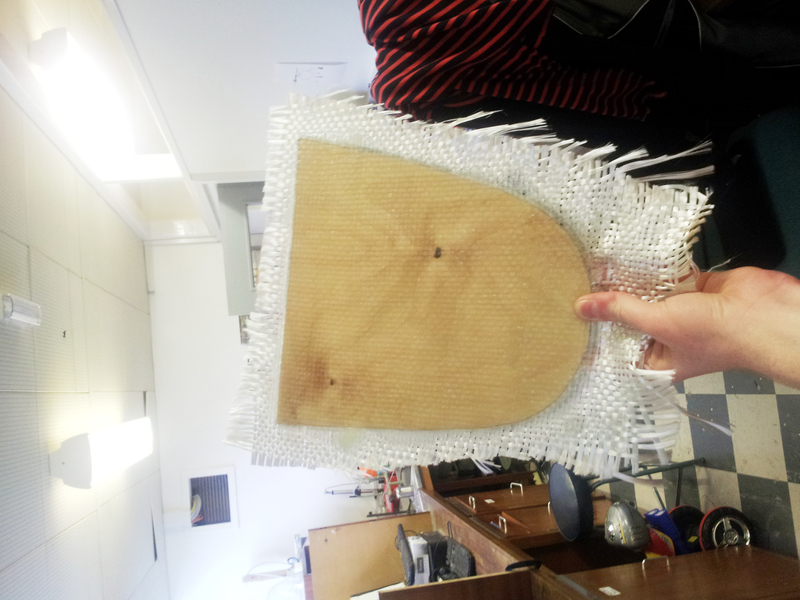 We then printed this template onto paper and traced it onto plywood. Then we cut down the middle rib to provide a seat for the electronics deck. Then the electronics deck and middle rib were fit into the hull. Next, we epoxied the deck down to the hull. 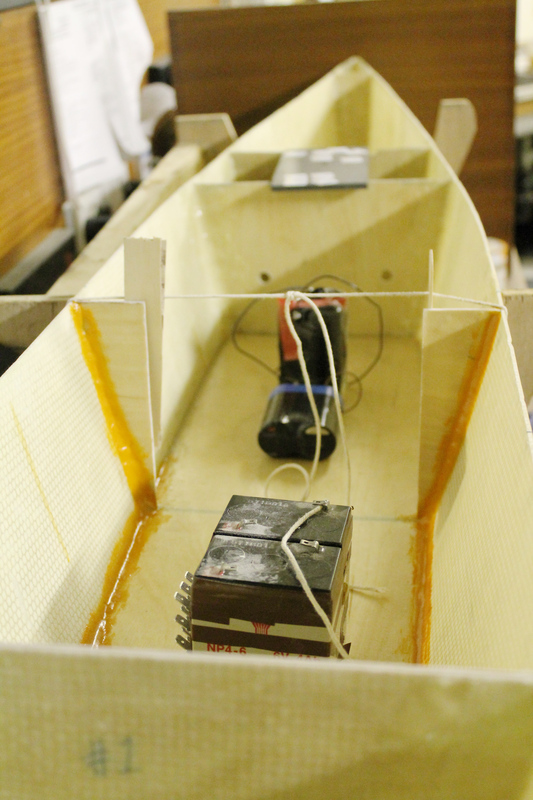 We used batteries as weights to maintain contact between the deck and the hull as the epoxy cured. The current state of the hull. A PhD student attempts to do work in the background, but can’t keep his eyes off our boat.